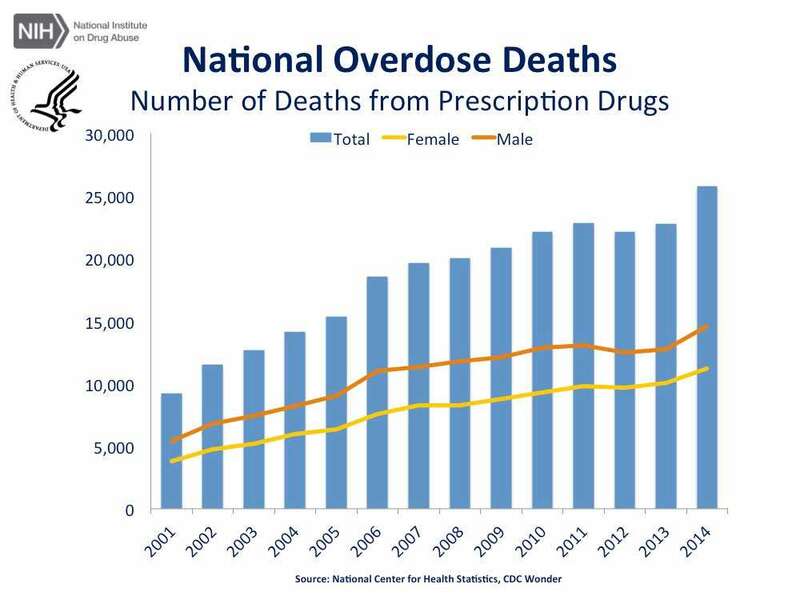 Back in December, CNN reported that “deaths from drug overdoses reached an all-time high in 2014” and that “deaths from overdoses of prescription drugs and heroin continue to be the leading cause of unintentional death for Americans, rising 14% from 2013 to 2014.” The chart from the National Institute on Drug Abuse (NIDA) details the horrific increase in overdose deaths between 2001 and 2014. State and national figures for 2015 have not been released yet, but I expect that they will show that there has been no abatement. These deaths and the permanent grief and loss that accompany those deaths can not be measured. I have written about the pain of parents, how some of them have desperately tried to help others, and how some of them have influenced policy. Regardless of the wonderful work that many of them engage in, they have all told me how the sorrow has not dissipated. Other writers and wonks have discussed the high costs of incarceration and treatment. Those are two areas of enormous public and private expenses that are well known. While it is fairly easy to see the link between the marketing of pharmaceutical painkillers and the modern opiate epidemic, it is probably impossible to force Big Pharma to shoulder some of the costs of incarceration and treatment (this is something that parents and advocates often argue for at round table discussions, conferences – I think their energy might be applied better to other goals…read on). But it is very clear that Big Pharma has contributed to this epidemic and has also greatly profited from it. Sam Quinones and I discussed the role of Big Pharma in creating the opiate epidemic, and one of my students wrote about how the Pharmaceutical Industry used continuing medical education sessions to influence doctors into peddling their drugs. These costs hold true for public workers. In June of 2014, the California counties of Santa Clara and Orange sued five pharmaceutical companies for “false advertising, unfair business practices and creating a public nuisance.” (you should click on the link, as I wrote about it back then – another lawsuit was also filed by the City of Chicago that month against many of the same pharmaceutical companies for similar reasons). It is well known that state, county, city and municipal budgets are struggling all around the United States (you can see this in the reduction of services, the increase in charges – even in the increase in traffic fines). Chicago, Santa Clara and Orange Counties crunched the numbers and clearly saw that opiate addiction had hurt public worker production and increased the costs associated with employing those workers. These cases have not been resolved, but I expect to see more and more suits filed by other municipal, county, city and (perhaps) state governments. A Los Angeles Times investigation found that, for more than a decade, Purdue collected extensive evidence suggesting illegal trafficking of OxyContin and, in many cases, did not share it with law enforcement or cut off the flow of pills. A former Purdue executive, who monitored pharmacies for criminal activity, acknowledged that even when the company had evidence pharmacies were colluding with drug dealers, it did not stop supplying distributors selling to those stores. Purdue knew about many suspicious doctors and pharmacies from prescribing records, pharmacy orders, field reports from sales representatives and, in some instances, its own surveillance operations, according to court and law enforcement records, which include internal Purdue documents, and interviews with current and former employees. Regardless of how one feels about people who use or abuse or are addicted to drugs (read the comments on news articles – it’s often disgusting), there are financial costs that are undeniable. Even if you believe that drug abusers are terrible, weak willed people who did it to themselves and that their parents should have done a better job, one can’t deny that it costs society an enormous amount of money. Some of these expenses should be recouped, and when the evidence of wrongdoing is as clear as it has been in the case of Purdue Pharma, everyone should write their Congressperson in support of investigating, fining and prosecuting them. Please write your Congressperson or call them. To find your Congressperson, click here.